Searching for the Small but Mighty! No need for night lights in this berth! Meet Jonelle Basso, a Marine Microbiology Laboratory Technician and a veteran sailor – this being her 8th trip to collect specimens. 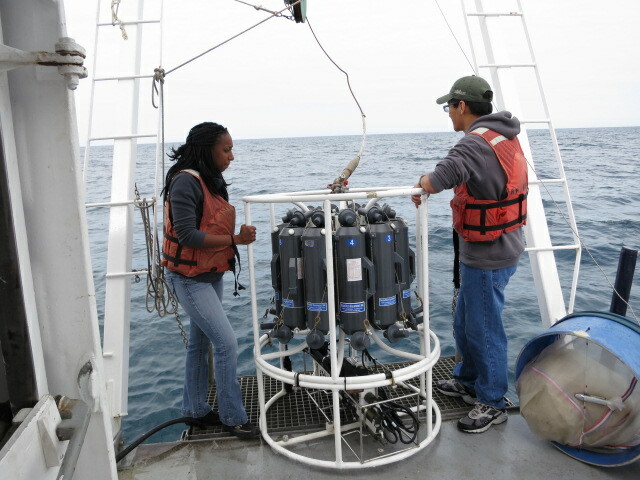 Jonelle may be searching for the smallest organisms in the sampling, but she is a professional at deploying all of the large equipment, CTD, Sipper and Bongos are no match for her. Jonelle collects water samples from the CTD and completes 2 types of tests on them. 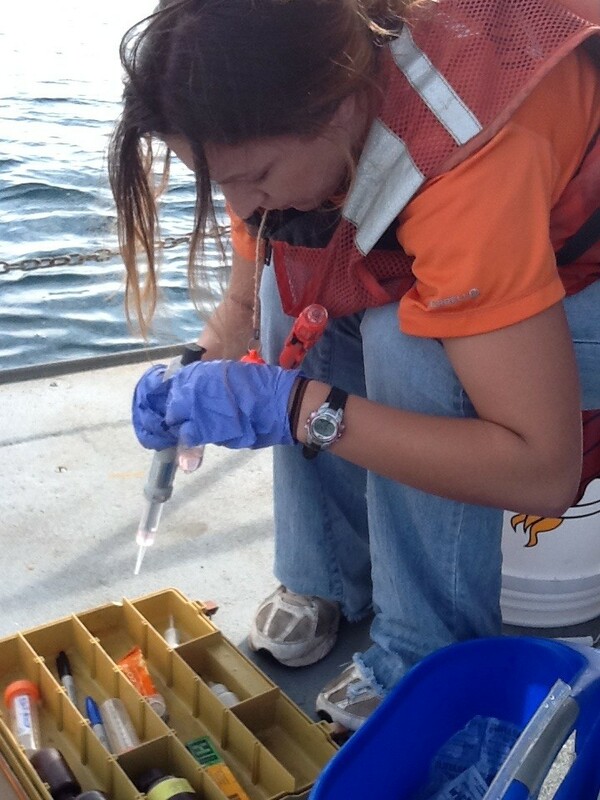 She runs a toxicity test using bioluminescent plankton and bacteria to measure how toxic the water is. The less light the little guys give off, the more toxic the water. Since this must occur in a low light area, the berths below ship are the perfect place, so she has her own night lights on board. Her other test is a mutigenicity test. 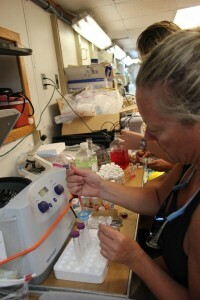 She introduces 2 strains of E. Coli into the water samples to see if they stimulate phage production. Both tests help her determine the health of the water. Jonelle and Tim preparing to deploy the ctd. Sanibel Island Girl Sails Away For The First Time! 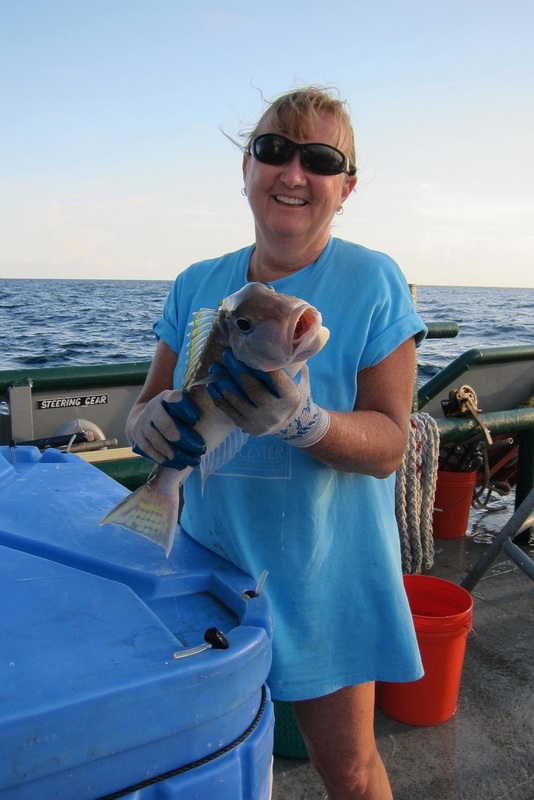 Jami Compton grew up on Sanibel Island where she spent the first 18 years of her life enjoying the natural beauty and safe environment that the barrier island offers. 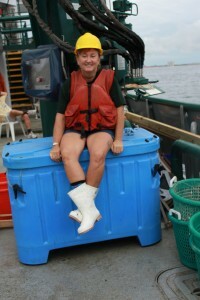 She went to USF-St. Pete and majored in Environmental Science and Psychology. She has been working for the Fish and Wildlife Conservation Commission’s collection lab, specializing in invertebrate collections, for the past year. 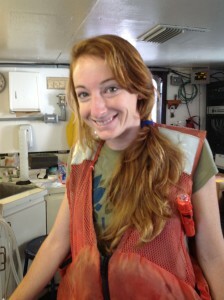 Jami in the wet lab aboard the Bellows. 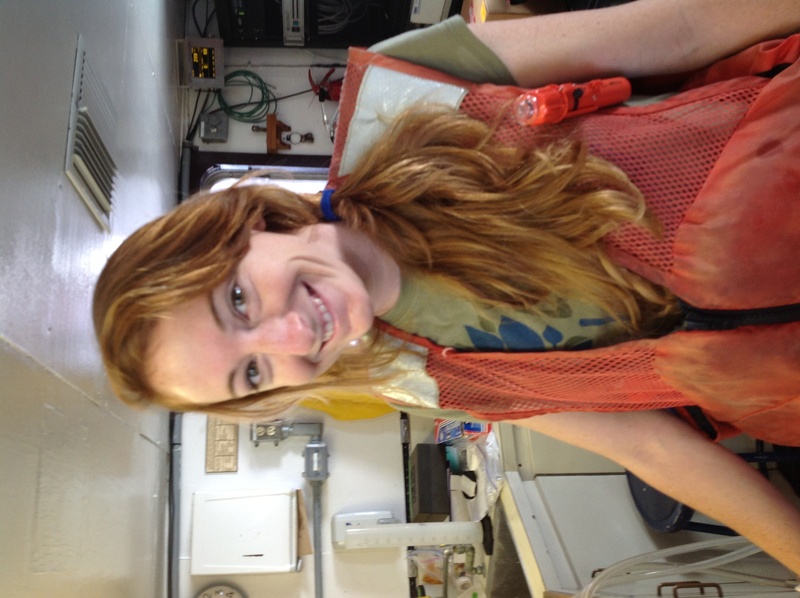 This is Jami’s maiden voyage on a research vessel! 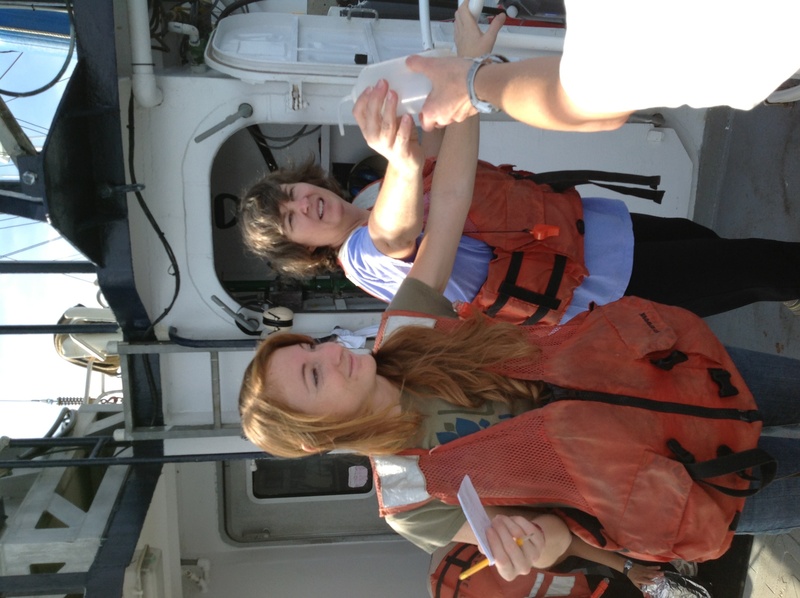 Through this experience, she is hoping to expand her knowledge of how research is conducted in the field. 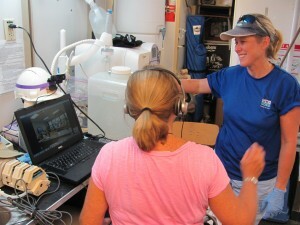 She feels the expedition is providing exposure to a whole other world outside of the lab! 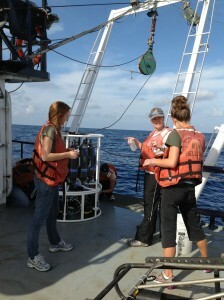 Jami, Teresa and Leslie on deck with the CTD. Jami and Abby on deck. The Sipper 3 may be one of the stars on this trip, but it’s value truly lies in its able engineer Karen Dreger. 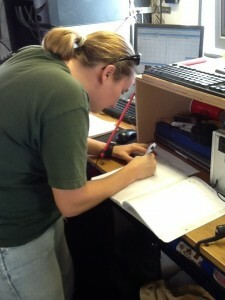 Karen is a Research Engineering Technician for USF. She is responsible for all aspects of maintenance, operation, and data analysis of the Sipper 3. Karen studies the abundance and distribution of plankton in areas of the Gulf that were unaffected and affected by the spill. Karen is a product of Pinellas County Schools. Science was her best subject and she won her 5th Grade Science Fair with a Project about Airfoil design. Clearly she was interested in Engineering at a young age. Karen and Abby Madeiros (Teacher at Sea) attended Oak Grove Middle School, but clearly during different decades. Data coming in from Sipper 3 deployment. Leslie has had a passion for Marine Science as long as she can remember and grew up near the Gulf in Corpus Christi, Texas. Her father was a chemistry teacher, and she spent hours creating science experiments in his lab during her childhood. 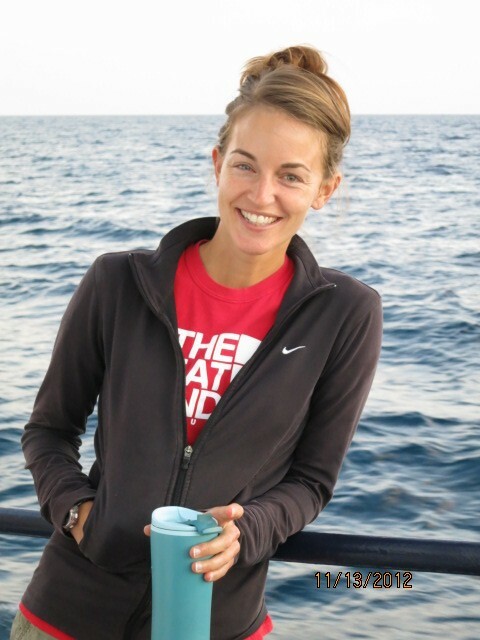 She says it’s truly a dream come true to participate in research cruises and explore our ocean for a living. She is Senior Biological Scientist in Dr. Kendra Daly’s Zooplankton Ecology Lab at USF. 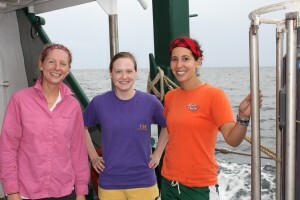 Her current research focus is on the lower end of the marine food web in the Gulf of Mexico. Leslie working to increase our knowledge of the abundance and distribution of phytoplankton and zooplankton and the potential effects of the Deepwater Horizon oil spill on their populations. At sea, Leslie’s research tasks include: performing bongo net tows for zooplankton collection, assessing water quality parameters using data from CTD sensors, water filtration and collection for chlorophyll a, accessory phytoplankton pigments, particulate organic carbon and nitrogen (to better understand ocean nutrient cycles and possible limitations), and dissolved inorganic nutrients. 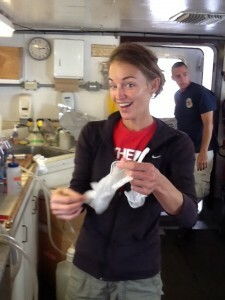 Leslie gets ready to collect water samples. Round Two: Here We Go Again! 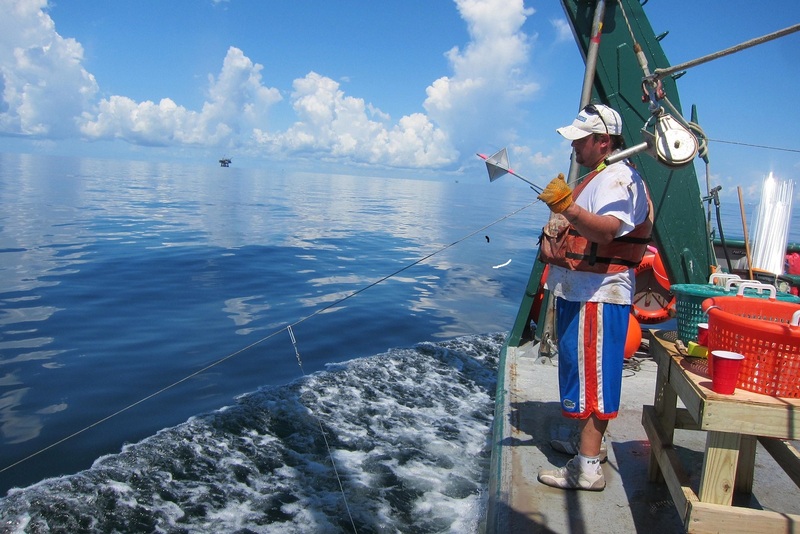 Favorable seas are predicted this time around, so keep your fingers crossed for us as we head back out! 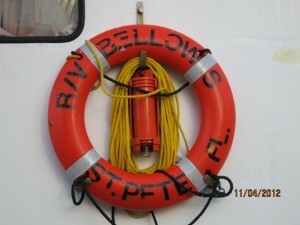 The Bellows left the dock around 09:00, and we are returning to the first station of the Southern transect. 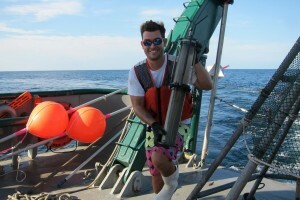 graduate and currently works at the Fish and Wildlife Conservation Commission. 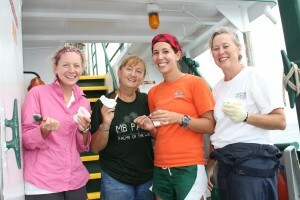 Left to Right: Jami, Abby, Teresa and Leslie on the mess deck. 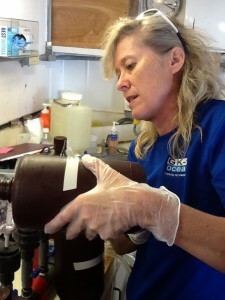 Dr. Teresa Greely pouring a water sample from the CTD into the filtration system in the inboard wet lab. 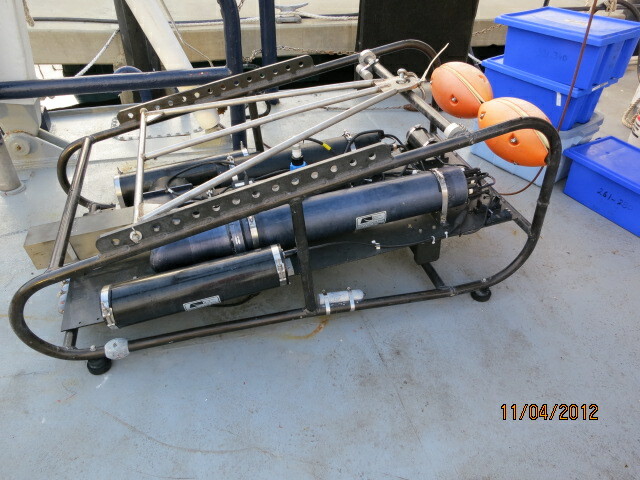 We reached the first CTD station around 14:00, the winch was used to deploy the CTD, and the Niskin bottles were triggered by the lab computer to collect water samples from varying depths. 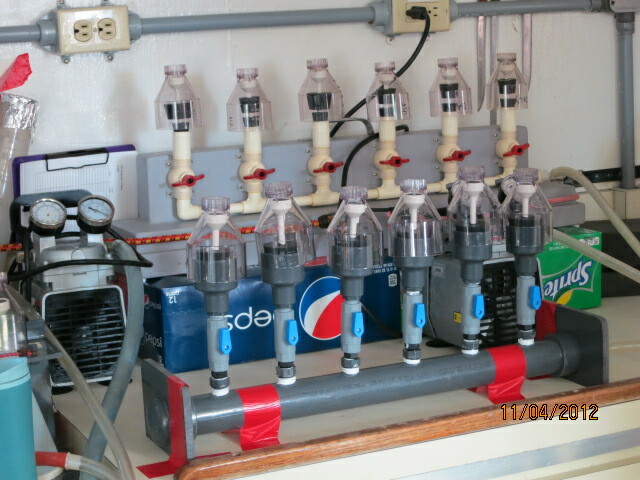 Upon retrieval, the samples were bottled, labeled, and brought into the lab for filtration. Samples were then preserved for future analysis back at the USF lab. 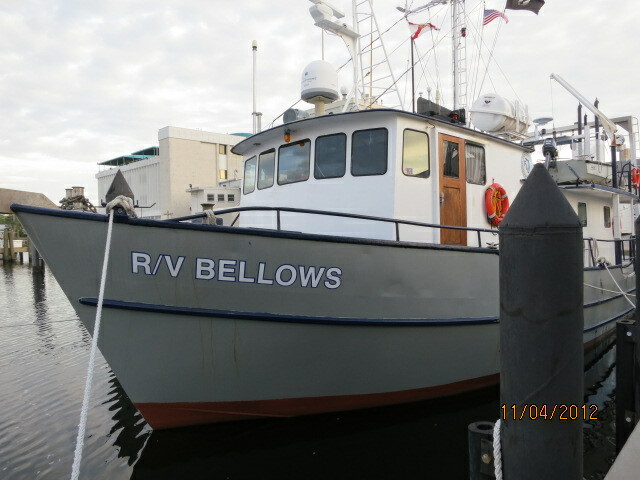 The RV Bellows is a 71 foot research vessel owned by the Florida Institute of Oceanography. It is 43 years old and was constructed in Tarpon Springs. It was originally deployed in 1969 to study the Bahamas. She is powered by two GM 6-71 diesel engines, with a cruising speed of 7 knots. 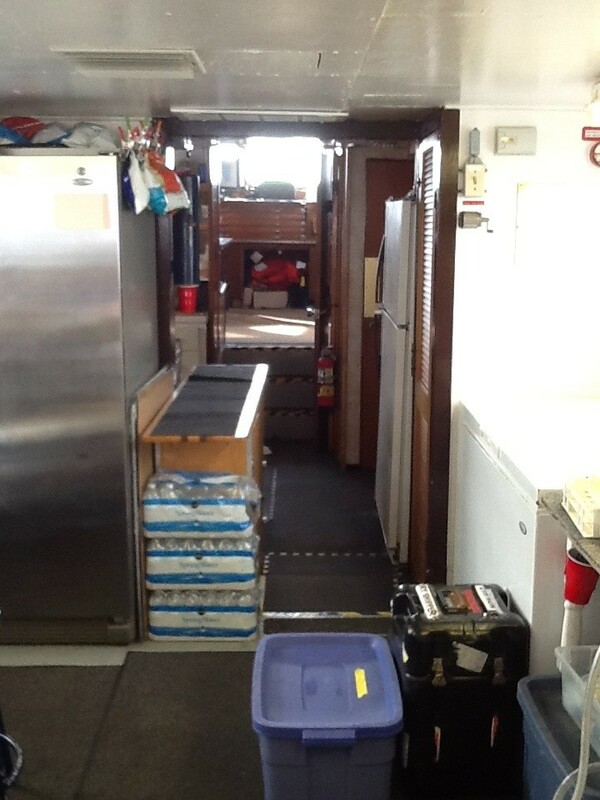 On the lower deck, there are ten berths available for scientists and four for the crew. Heads are located on both levels. Aft of the bridge is the galley, followed by the onboard 12’ by 14’ wet/dry lab. The bridge not only accommodates all the equipment for navigating the ship, but also the mess deck for dining on spectacular cuisine! Joining the Bellows for this cruise is visiting University of Miami Graduate Assistant in Biological Oceanography; Sharien El-Tourky. 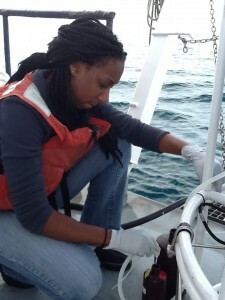 Sharien is a zooplankton ecologist in search of the copepod Farranula gracilis. 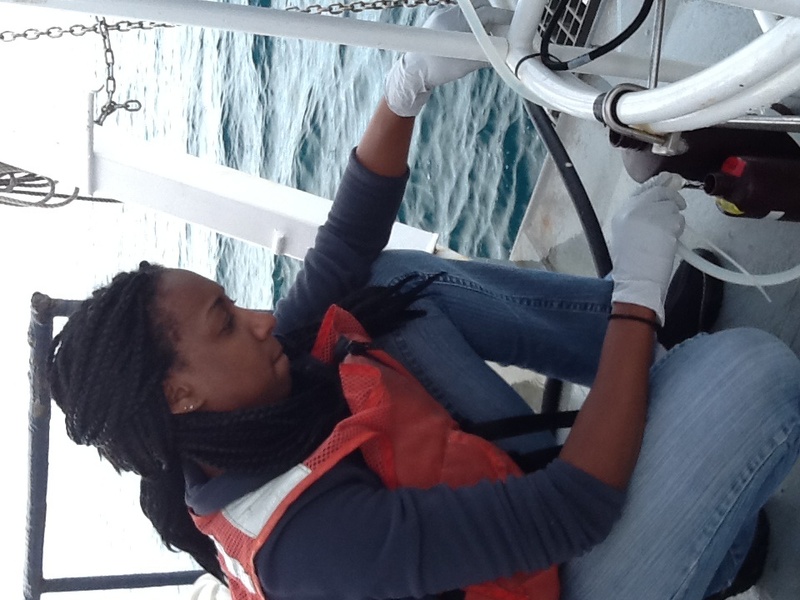 Part of her research involves measuring the egg production of these Copepoda in order to determine the amount of energy they produce. Welcome aboard the R/V Bellows! 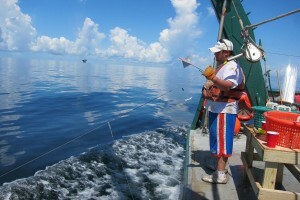 on the Gulf’s ecosystems. Departure was at 08:00. 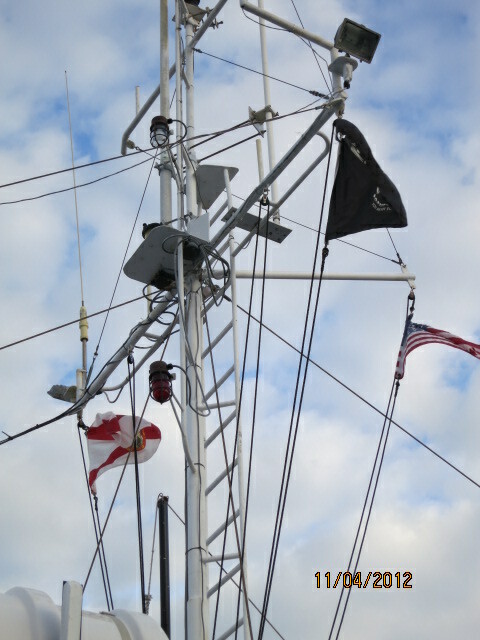 Flags flying above the R/V Bellows. Our safety briefing included important information such as always wear PDF’s (personal flotation devices) and closed-toe shoes while on deck and don’t go out on deck alone at night! Life Ring on the Bellows. Chief scientist for the cruise is Dr. Kendra Daly. 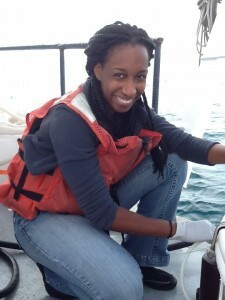 For further information about her Zooplankton Ecology Lab, please visit www.marine.usf/zooplankton/. 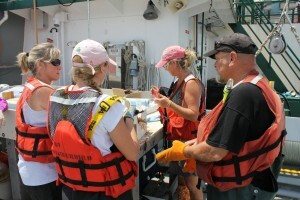 Science personnel onboard include four scientists from the College of Marine Science/USF: Leslie Schwierzke-Wade – Chief Biological Scientist, Karen Dreger – Research Engineering Technician and SIPPER operator, Jonelle Basso – Marine Microbiology Lab Technician, and Teresa Greely – Ocean Biologist and Educator; Tim Lee, a USF graduate student; Sharien El-Tourky – Zooplankton Ecologist and graduate assistant at RSMAS/University of Miami; and two C-IMAGE Teachers at Sea – Abby Madeiros and Eileen Hayes. 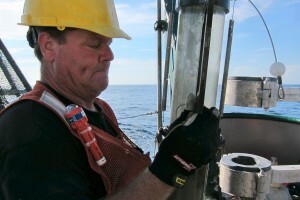 CTD on deck of Bellows. Farranula gracilis. The entire process had settled into a well-run routine. even a full 24 hours later. Such is life at sea! 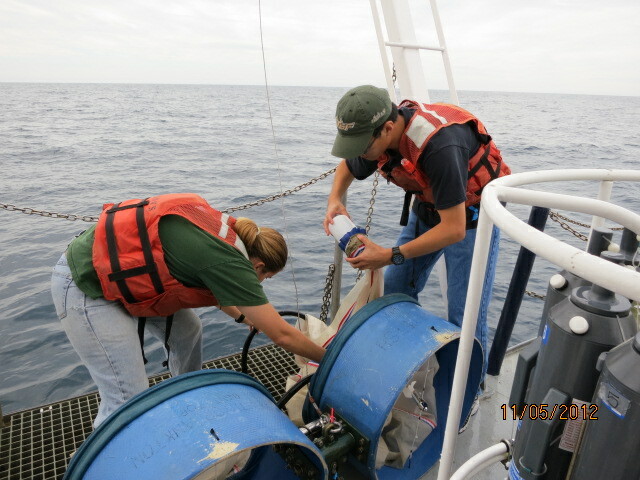 Karen and Tim preparing to deploy the Bongos (plankton tow nets). As we were preparing to end our cruise, we interviewed both of the Chief Researchers, Dr. Steve Murawski and Dr. David Hollander and asked them for their closing thoughts on Leg 1 of the C-IMAGE expedition. Both expressed satisfaction with the success of the research, the extent of samples and data collected and with the collaboration between the two teams of investigators. 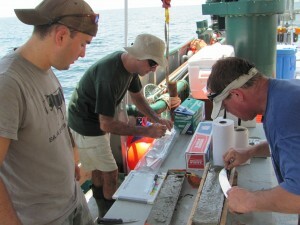 Dr. David Hollander wrapping sediment core samples before placing them in freezer for preservation. Samples will later be shared with geologists and chemists around the world. Dr. Hollander expressed that the success of the research was due to the mutual respect and team work shown by both groups of researchers. 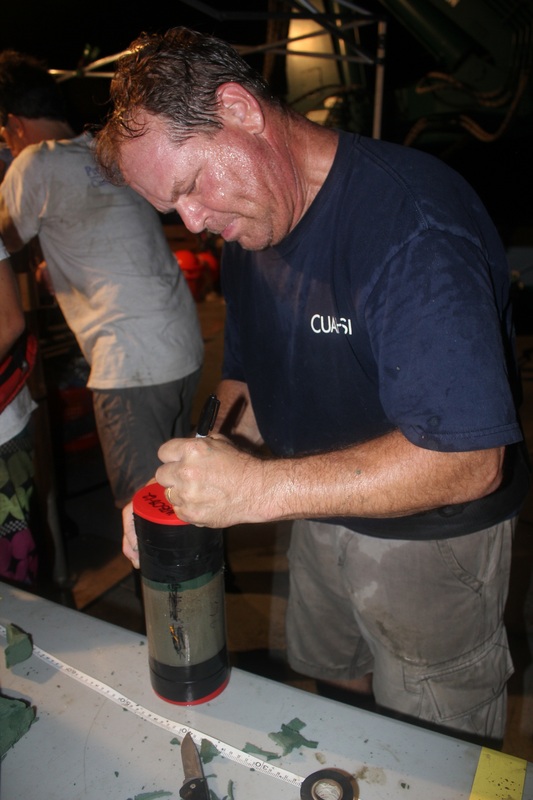 The very efficient method of collecting fish samples during the day and core samples at night enabled them to collect more samples than expected. 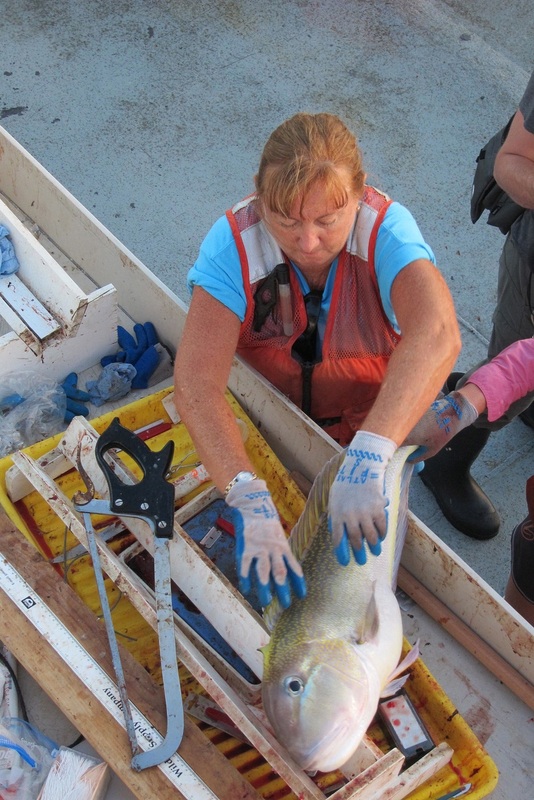 Most importantly, they captured the sediment/ water interface which shows the most modern conditions so scientists can correlate the modern fish conditions with modern sediment conditions to paint a more complete picture. 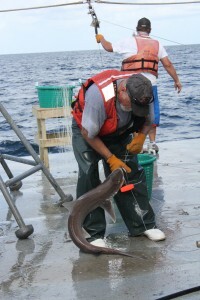 Dr. Murawski with a deep water eel. Dr. Hollander was ecstatic that core samples were retrieved throughout Desoto Canyon, from multiple sites ranging from 100 to over 1,500 meters deep with eight cores recovered from most sites. Not only are USF scientists analyzing the contaminant chemistry of the pre-blowout, the blow-out event itself and the post blow-out recovery, but also C-IMAGE scientists from the Netherlands, Germany, Canada, Penn State, the University of Texas and Eckerd College to name a few. One of the reasons for success was the flexible, adaptable nature of both Dr. Murawski and Dr. Hollander. When asked for his opinion of why this venture was so successful, Dr. Hollander sited the fact that “leadership by example” was a premier aspect of this cruise. 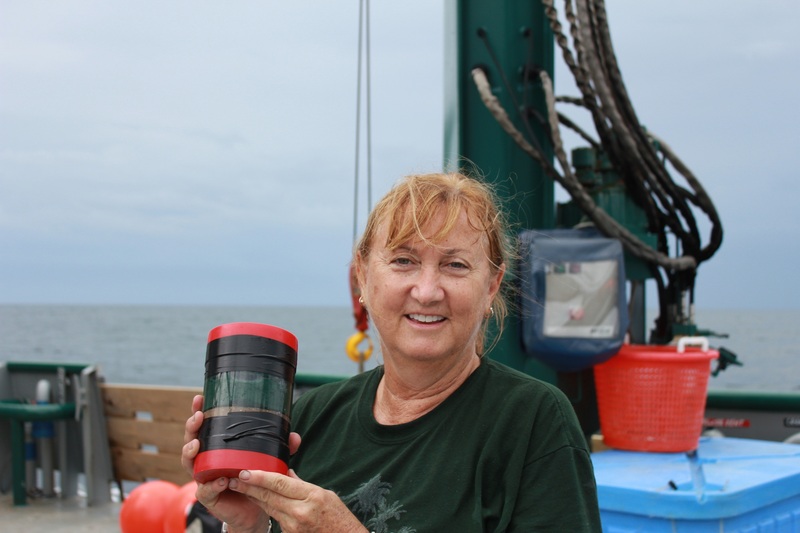 He expressed that having Dr. Jaqueline Dixon, the Dean of the College of Marine Science, aboard and her willingness to pitch in wherever and whenever needed, set the tone for the kind of collaboration and mutual respect all participants have for each other. 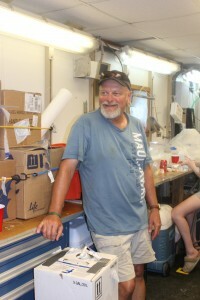 Dr. Steve Murawski expressed that on this cruise, they were able to demonstrate that they can integrate vastly different technologies on the same ship to get samples, showing that they can design more cruises like this one. Another advantage of this integration of science disciplines is in getting different scientists such as chemists, geologists and biologists, together enables them to discuss what they are observing, what kinds of experiments they want to do, and analysis of data. 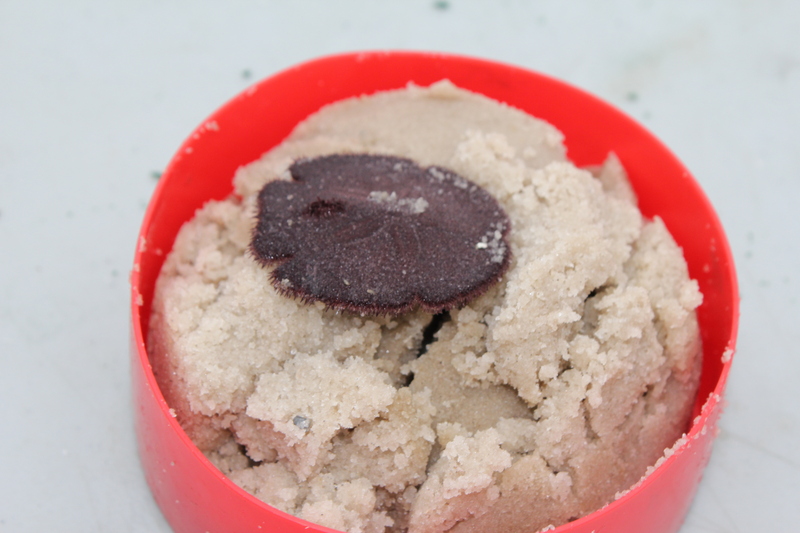 It is not just about the sharing of samples, but the sharing of ideas that proves beneficial to all. Dr. Murawski examining a deep water fish and removing tissue samples to be shared with other toxicology researchers. Dr. Murawski stated that by looking at the core samples, his team will be able to prioritize some of the fish samples they will analyze to see if they might detect some of the contaminants found in the sediment samples. In the next leg of the cruise (Leg 2), they will start exploring southwest of the oil blowout, an area not yet explored in detail. He is looking forward to the chance to go to the Mississippi Valley and Gulfport, which are very important sites to explore. 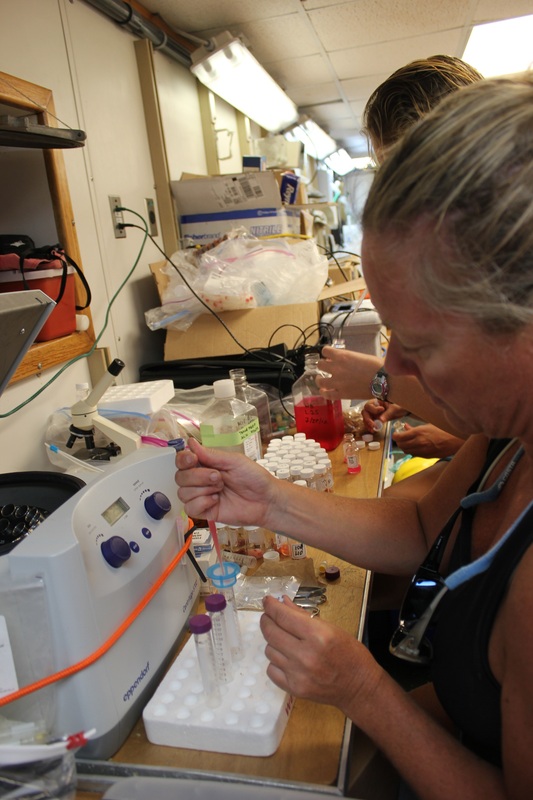 On the biological side are the objectives of trying to understand how the oil may have impacted animals that live on the bottom. 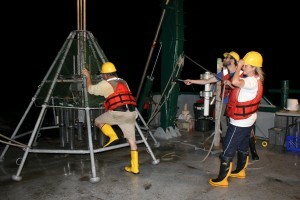 Both Dr. Hollander and Dr. Murawski agree that the goals and aspirations of the C-IMAGE Project, which is to explore the interaction of the chemical fate of the contaminants in the system and their biological impacts on the ecosystem are obtainable when scientists work as collaboratively and efficiently as was exemplified on this cruise. The best part of this experience was seeing the diversity of fish species. Dr. Teresa Greely asked me to sum up the experience of being the first “Teacher at Sea” for C-IMAGE. 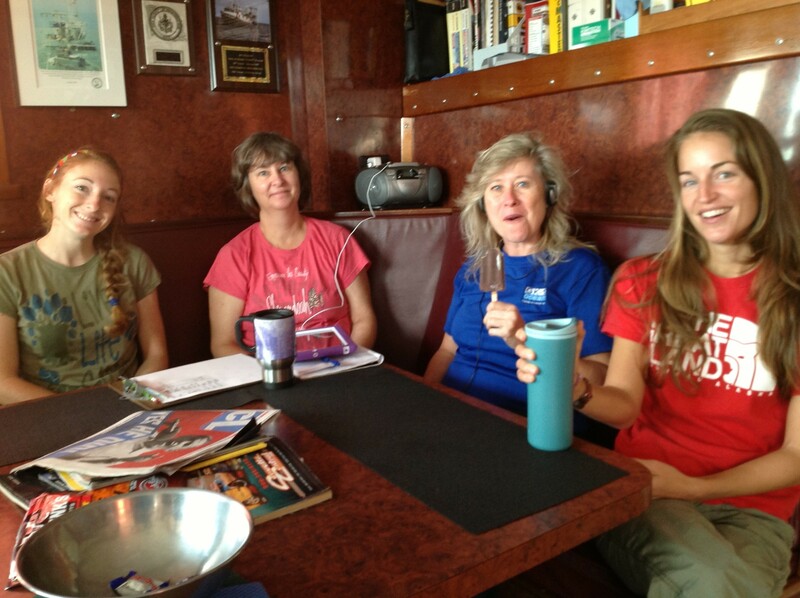 It is hard to express how the 8 day adventure aboard the Weatherbird II will influence my teaching, and the impact it will have on my future students in the few words of a blog. 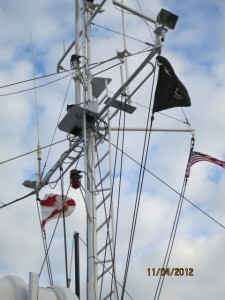 Spending the week aboard the 115 foot R/V Weatherbird II is a privilege in itself. 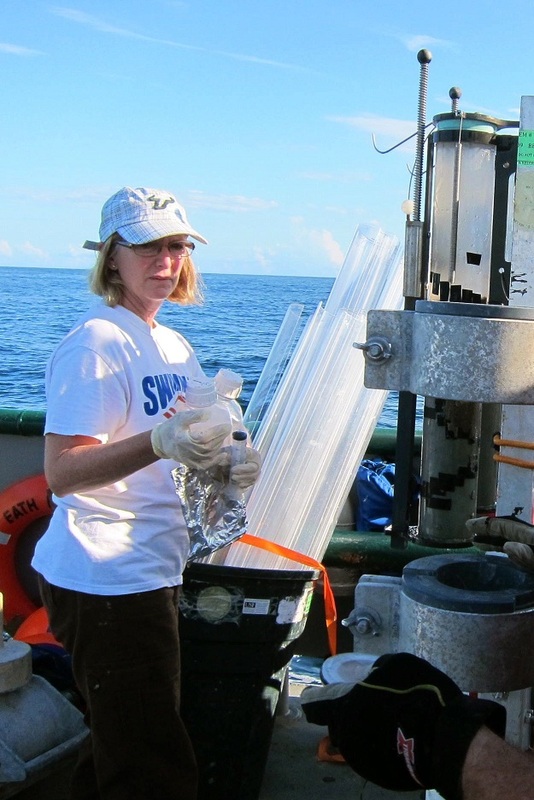 This research vessel has been instrumental in responding to the scientific need for studies of the area most likely affected by the Deepwater Horizon Blowout in 2010. Since that time, the Weatherbird II, operated by the Florida Institute of Oceanography, has made numerous expeditions to selected sites, collecting data that is shared with institutions and scientists all over the world. It has played an integral role in the collecting of geological, hydrological and biological samples. Any research vessel is only as productive as the crew and science research parties manning it. It was the experience of living and working alongside these phenomenal and dedicated professionals that will have an impact on my professional development and ability to inspire my students to become the oceanographers of the future. One of the most beautiful partnerships I have ever witnessed was the working relationship between the two science teams aboard the vessel. There was the biological team, headed by Chief scientist Dr. Steven Murawski, studying the potential physiological effects on the health of the fish caused by the Deepwater Horizon catastrophe. He was joined by three of his newest graduate students and a chemical environmentalist, Erin Polster from Mote Marine Lab (C-IMAGE partner institution under Dr. Wetzell). Scientists from many different disciplines sharing a very small lab aboard the Weatherbird II, all with mutual respect for the work each was doing. At the other end of the science spectrum lie the fields of geology, geochemistry and paleontology. These distinct disciplines merge together and overlap when investigating the geological stories that can be deciphered through a study of sediment samples. 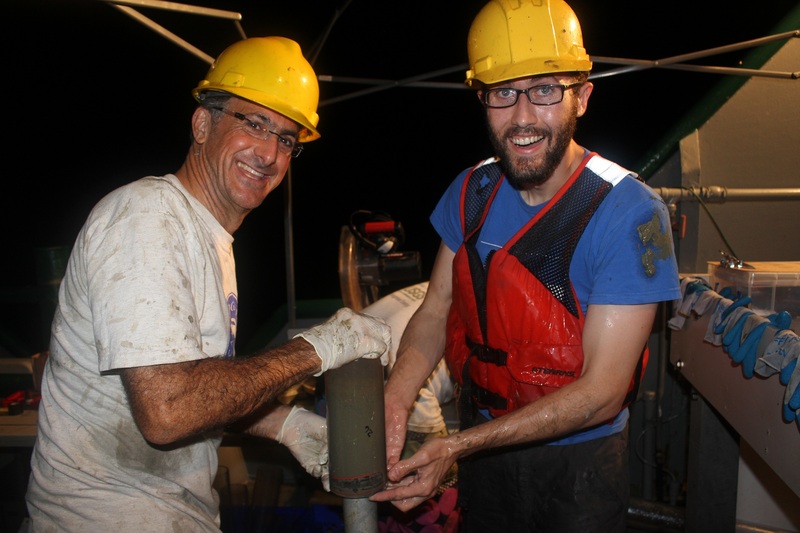 The effects of the blowout on the sediment, the micro-fauna that live within the sediment and the chemistry of the water found just above the sediment were the focus of the team led by Dr. David Hollander and his team. 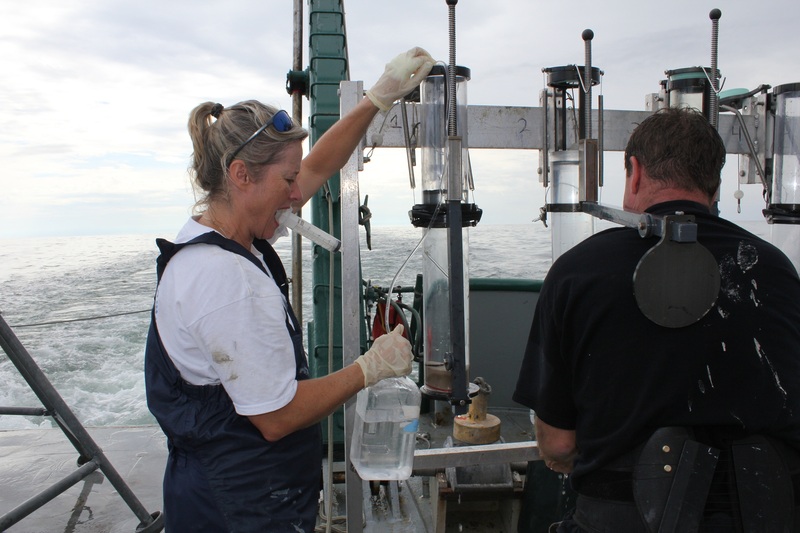 Dr. Teresa Greely collecting water samples to be filtered and used in the study of the microbial ecology just above the sediment surface. 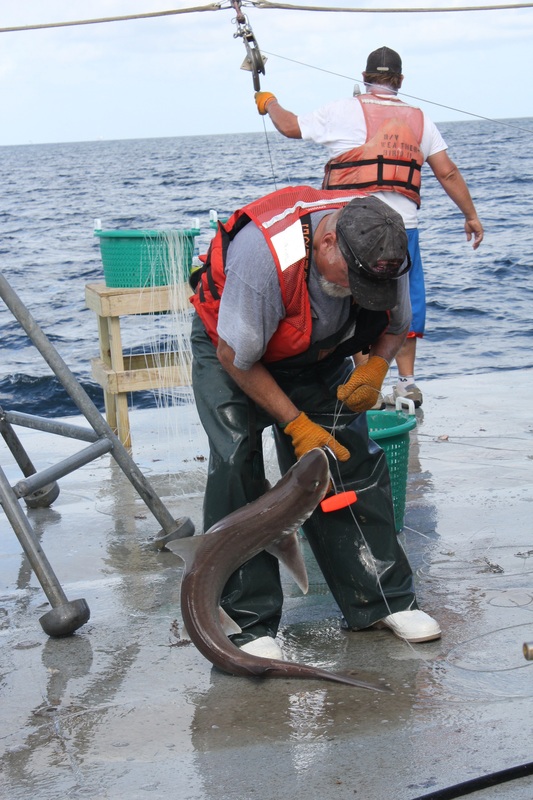 This research is being conducted by researchers at the University of West Florida (C-IMAGE science partner, Dr. Wade Jeffrey). 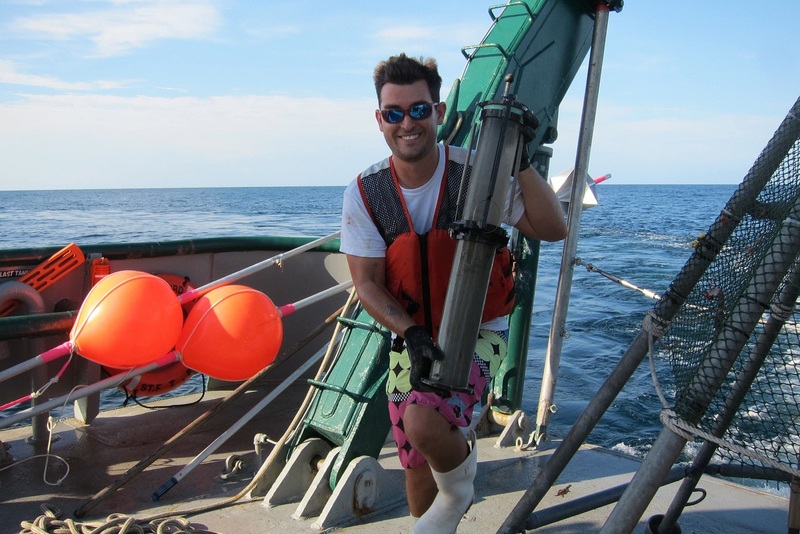 Each night, the team, under the supervision of post graduate, Patrick Schwing, sent down to the seafloor a multi-corer, a spaceship-looking structure that has the potential to collect eight core samples simultaneously at extreme depths. These samples are of such importance in piecing together the mystery of what happened, what the impact of the blowout has been and what the impact may be in the future. 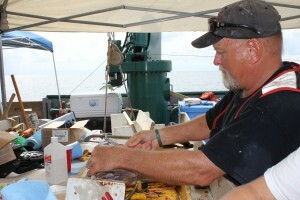 These samples are collected, transferred undisturbed to more permanent storage containers, labeled and preserved to be studied in detail by several different investigators. All of this hard work is time-consuming and at times dangerous. 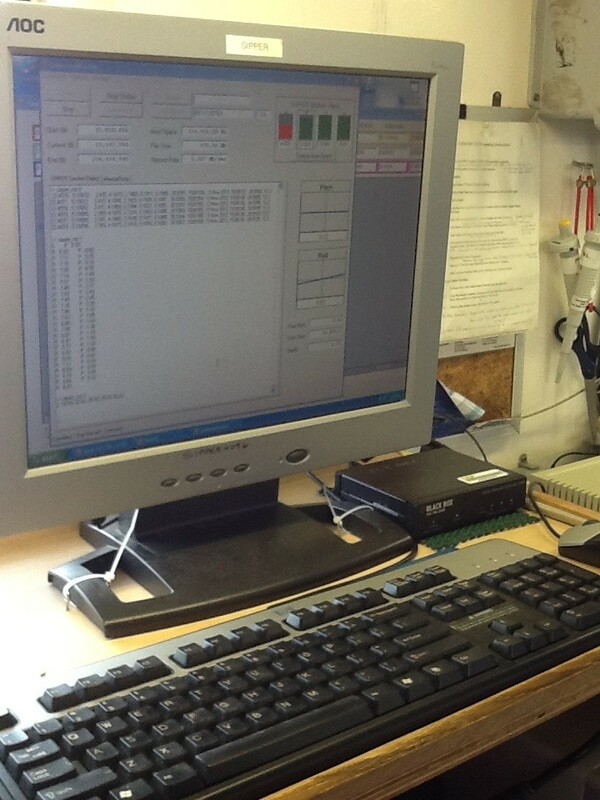 The process ran like clockwork and was repeated at different study sites two or three times each night. 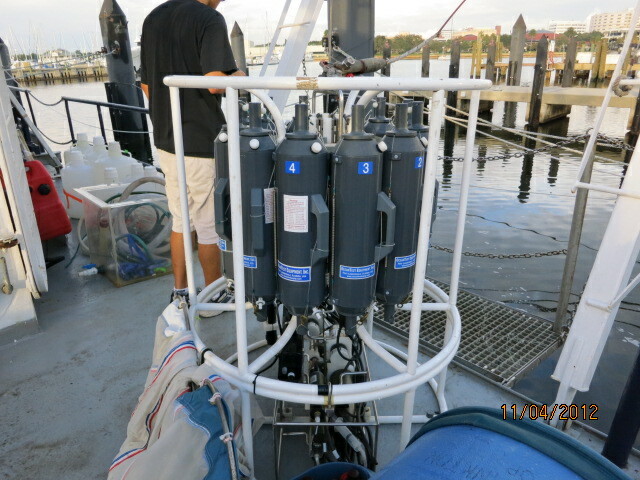 Once aboard, water samples from both above the sediment and within the sediment were collected, and will be shared with geochemists studying the chemical hydrology. So there you have it; scientists of every background and interests sharing the work and the resources all at the same time. It came together beautifully. Unlike oil and water, the various disciplines of science do blend together to form a productive solution. 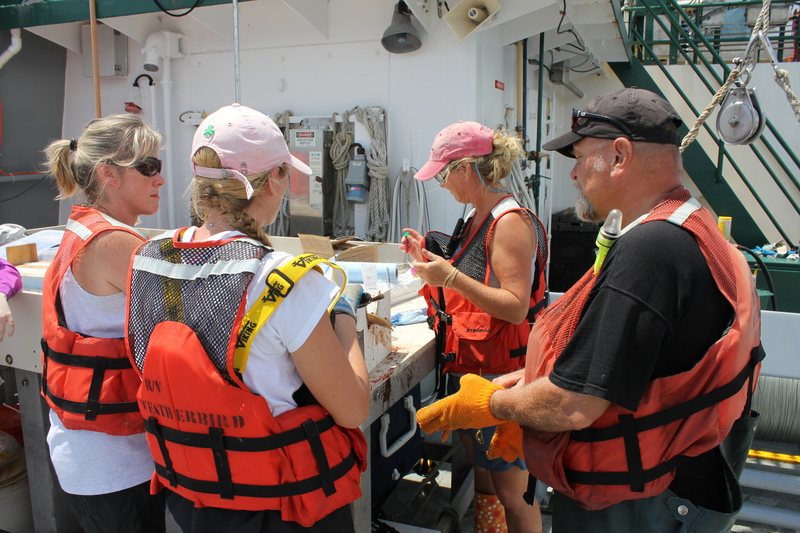 As Marine Science teachers, we know and teach that Oceanography is an inter-disciplinary science, encompassing the biological, geological, physical and chemical sciences. Yet, we each have come from a background specializing in one field, in my case, zoology. The next “Teacher at Sea” might have a chemistry or physics background. It is easy to forget that ideally oceanography is best studied as the inter-twined conglomeration of all the fields of science. Oceanography is the epitome of collaboration between disciplines. This interaction and merging of the fields was what impressed me the most about the research. In biology terms; it was the perfect execution of mutualism! These scientists showed mutual respect for the work of each other. 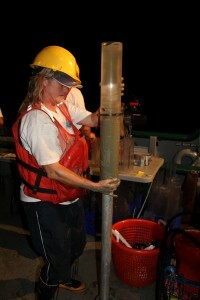 Fish biologists interested in the composition of the sediment, geologists pulling long-lines, a deck-hand pulling in the CTD water profilng device, a journalist attaching a camera to the multi-corer, a chemical geologist helping the post-graduate process core samples in the middle of the night and the Dean of the College tying fish hooks onto the long-line. It was so inspiring to witness the sharing of work as well as the excitement of discovery. No egos in the way on this expedition. Everyone was cooperative and enjoyed exploring together. The collaboration allowed the goal of C-IMAGE to be reached, to show the interaction between the chemical fate of the contaminants in the system and their biological impacts. This mutual respect and collaboration among scientists is what I hope to share with my students. It was an honor to witness this type of collaboration, much less to participate in it. Here I am taking a core sample to the refrigerator for preservation after it has been collected, transferred to a storage tube and labeled. 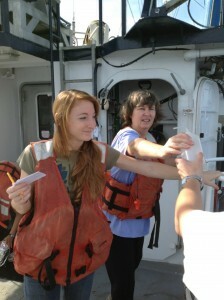 I recommend participation in the C-IMAGE “Teacher at Sea” program for any teacher, especially a science teacher. The teacher is the best way to spread the message of ocean conservation with students for years to come. As for my advice for the next “Teacher at Sea”; bring more old clothes, lots of very old, disgusting clothes, clothes that you won’t mind disposing of in the closest trash can on the way home! Dr. Greely and I talking to high school students through SKYPE.